Sketch by Jerry Lemenu from Odeh's 2015 sentencing. Palestinian terrorist Rasmieh Odeh is about to be deported to Jordan. U.S. District Judge Gershwin A. Drain formalized terms of a plea agreement during a sentencing hearing Thursday afternoon in Detroit. It was not immediately clear when Odeh, a Chicago-based Palestinian activist, will leave the United States, but there are not expected to be problems getting her to go to Jordan, where she remains a citizen. It is up to Immigration and Customs Enforcement to arrange her departure. Odeh was convicted of naturalization fraud in 2014, but an appeal led to a new trial date last May. She opted to plead guilty in March and agree to deportation in exchange for a promise of no jail time. She was fined $1,000. Odeh became a national icon for anti-Israel forces throughout the United States and beyond, embraced both as a hero of Palestinian resistance and as a purported victim of an unjust, racist prosecution. 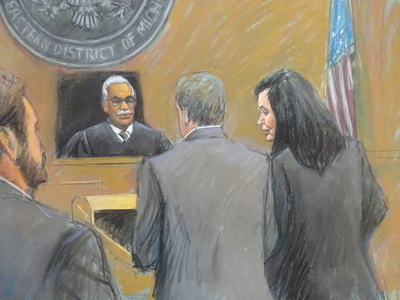 According to Detroit Free Press reporter Niraj Warikoo, U.S. District Judge Gershwin A. Drain had to cut Odeh off repeatedly during the sentencing hearing when she used her time to address the court to attack Israel. 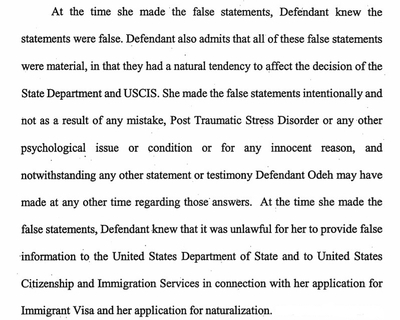 Her prosecution stems from her failure to disclose her terrorist past to U.S. immigration officials. Odeh confessed to her role in a 1969 Jerusalem grocery store bombing that killed college students Leon Kanner and Edward Joffe. She claims the confession came only after she endured weeks of brutal torture. But there is nothing to corroborate that claim. In fact, the records that do exist indicate that she admitted her guilt the day after her arrest. Investigators searched her bedroom and found explosives similar to those used in the grocery store and in a separate attack on the British consulate. Odeh lied to U.S. immigration officials when she applied for a visa in 1995, and again in 2004 when she applied to become a citizen by saying she had never been arrested, convicted or imprisoned. Had she truthfully disclosed her conviction for a 1969 terrorist bombing in Jerusalem, she never would have been allowed in to the United States, let alone naturalized. Every prosecutor and immigration official involved in the case said so. A 2014 jury trial ended with a quick conviction, prompting an appeal, a new trial date and ultimately her guilty plea. She claimed that her lies to immigration officials resulted from post-traumatic stress resulting from this unproven torture. But her guilty plea – that she signed – clearly indicates that claim is bogus. Her false statements were made "intentionally and not as a result of any mistake, Post Traumatic Stress Disorder or any other psychological issue or condition..."
Days after a formalizing her plea in court through gritted teeth, Odeh again was telling supporters that the immigration charge was "phony," and blamed "the racist nature of the justice system in this country" for giving her no choice but to plead guilty. She failed to explain how such a racist justice system granted her a new trial that she chose not to have. As Cornell University law professor William Jacobson detailed in our interview with him, every aspect of Odeh's story falls apart upon the slightest scrutiny. Yet, as our video series, "Spinning a Terrorist Into a Victim" shows, Odeh's dedicated supporters accept every false claim and stand by her. Hating Israel is more important than determining what's true or considering the morality of latching their cause to an unrepentant terrorist killer. A couple dozen of them gathered outside the U.S. District Courthouse in Detroit Thursday, the same people who have stood by her since 2013, chanting the same slogans about community leaders being "under attack," and saying that, after all the information has come to light, "Rasmieh is welcome here." Odeh now walks in the footsteps of other Palestinian terrorists who managed to hide in plain sight in the United States for years, aided by lies and the gullibility of Israel-haters to believe every horrible evil alleged against the Jewish state and swallow every lie from a Palestinian "advocate." Sami Al-Arian is hailed as a free speech advocate and a peaceful proponent of the Palestinian cause. In reality, he was a member of the Palestinian Islamic Jihad's leadership as it used Iranian money to kill Jews. A federal judge deemed him a "master manipulator." He was deported to Turkey in early 2015. The Dallas Morning News faced picket lines and faux websites because it dared to expose the network of Hamas supporters, including political leader Mousa Abu Marzook, in its community. When an arm of that network, the Holy Land Foundation for Relief and Development (HLF), was prosecuted for illegally routing $12 million to Hamas, well-meaning but ignorant protesters argued that "feeding widows and orphans is not a crime." It isn't. But sending money to a designated terrorist group is, and the record shows that is what HLF did. Marzook, who created a network of Hamas-support organizations that included the HLF, a propaganda arm called the Islamic Association for Palestine and a think tank, was deported to Jordan 20 years ago and remains a senior Hamas official. Palestinian Islamic Jihad and Hamas share certain goals and values. To each, it is not a question of whether a peaceful settlement to the Israeli-Palestinian conflict is possible. It never will be acceptable. What is acceptable is violence against civilians. "The creation of a state of terror, instability and panic in the souls of the Zionists" is a goal spelled out in the Islamic Jihad's internal bylaws, which federal investigators seized from Al-Arian. Hamas unveiled an updated charter this year with some more sanitized language, but it remains committed to never recognizing Israel's right to exist, and demands "the full and complete liberation of Palestine, from the river to the sea." In other words, no peace while Israel exists. Meanwhile, it continues to prioritize building attack tunnels and gearing up for its next war with Israel over the economic and physical well-being of Palestinians in Gaza. Rasmieh Odeh bombed that grocery store before either group was created. So America has lost a pioneer in Palestinian terrorism. Take note of who grieves for that loss more than the loss of life she caused.